The Verge Center for the Arts in downtown Sacramento was standing-room only on Friday night as students, professors and members of the community gathered for the Stories on Stage Los Rios night. 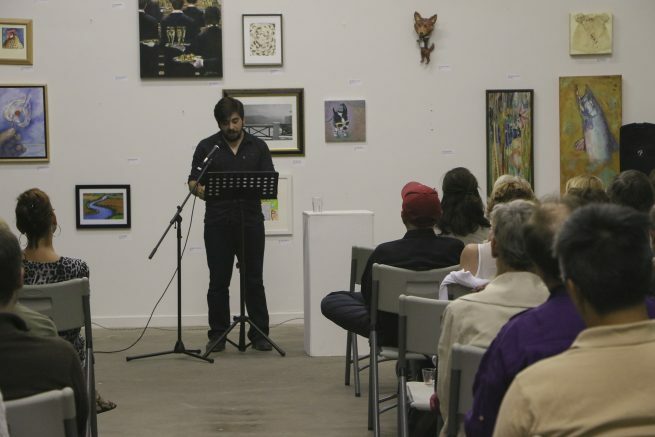 Local actors Jessica Laskey and Pano Roditis did live readings of four stories, each chosen from the literary journal at their respective colleges. American River College’s story, “Tradesman” by Rachel Gardner, was selected from the 2016 American River Review by Stories on Stage volunteer Laurie Rivlin Heller with help from ARR adviser and ARC English professor Michael Spurgeon. Laskey read the selections from Sacramento City College, Folsom Lake College and Cosumnes River College before a brief intermission. Roditis read “Tradesman,” the longest of the four pieces, after the intermission. Gardner said a few words on her piece before the reading, and said that the story comes from her belief that the United States is a nation of immigrants. Gardner also said her story comments on the instant gratification that Americans expect in their relationships as well as the rest of their lives. “Your value in this nation is predicated by ‘what can you do for me, at this minute,’” Gardner said. Hector threw out the trinkets and paid his uncle out of his own pocket, pretending he sold them. The story’s overarching theme was one of the importance of honesty, even if it will hurt the ones you love. After the event, Gardner said it was “unbelievably cool” to have her piece read. Gardner said Roditis did an amazing job reading her piece. Sue Staats, host and curator of Stories on Stage, said she had the idea for a Los Rios night a year ago, but had to figure out how to coordinate it. She intends to host Los Rios night annually. She got her start as a writer at SCC and wanted to honor the programs at community colleges. She said the regular Stories on Stage attendees wouldn’t have been exposed to community college literature otherwise, and that it gives the writers the opportunity to see that Sacramento has an audience for them. Samantha Daniels, editor-in-chief of the 2017 edition of the ARR, was present at the event and said she liked all the stories, but especially liked how they did Gardner’s piece. Be the first to comment on "Stories on Stage brings student literature to the Sacramento community"